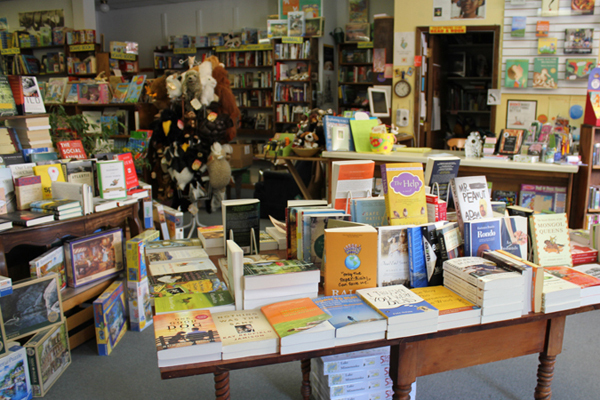 Excelsior Bay Books is Excelsior, Minnesota's locally owned & independent bookstore. The atmosphere is casual and inviting with a comfy seating area in the center of the store. We have an interesting mix of titles and can special order anything not on the shelves. Our children's section is outstanding! All books and toys are hand-picked for quality and fun. We also offer a great selection of reading accessories (reading lights, bookmarks, book plates), Folkmanis puppets, puzzles, notecards, and educational gifts and toys. We opened in the spring of 1996 at 36 Water Street (historic Excelsior's main street), just down the block from Lake Minnetonka. Dunn Bros. coffee and Licks Unlimited ice cream are right across the street. We are dog-friendly. Come in and browse, or shop online! Check out our staff picks to see our personal favorites. Thanks for visiting!